Updated for 2018! This article has been recently updated to provide you with the most accurate steps possible.This page contains affiliate links which means we may earn a commission if you use them. We only recommend tools and services that we use ourselves and that we trust. Starting a new blog is one of those life moments that’s both exciting and scary at the same time. Like driving a car for the first time, the possibilities of the open road ahead of you can seem endless; at the same time your inexperience could also lead you to an awful crash on the roadside! Ok, so maybe starting a blog isn’t SO dramatic, but it can definitely be intimidating your first time. Rest assured - we’re here to be your guide on this journey towards setting up your brand new blog on WordPress! The first step is to setup hosting and choose your domain name. While this may sound technical and intimidating, it’s actually quite simple and doesn’t require a whole lot of technical know-how. Don’t believe me? Just check out the steps below and tell me that doesn’t look dead easy. We use Bluehost for hosting all of our websites and we highly recommend them. Of course, there are other options available, but Bluehost has always been super reliable and their 24/7 support answers all my questions without making me feel dumb. That’s a good thing. Visit Bluehost.com and click Get started now. While the Starter plan may look appealing at less than $4 a month, trust me on this one, once you see how easy it is to setup your own website you’ll want to do it again and again (heck, you might even make a business out of it). The Plus package gives you hosting space for an unlimited amount of websites - that’s a steal for less than $7. Type your desired domain into the field to see if it’s available. Try to pick something memorable and not too complicated or difficult to spell. If your domain is available (yay! ), all that’s left is to fill in your details and complete registration. Hint: you don’t really need all of the extra stuff they try to sign you up for, so you can uncheck those boxes if you like. It's completely up to you of course. Once you’ve complete the signup and set your password, you'll go straight into the WordPress setup! You'll be asked to pick a theme - it doesn't matter what you pick, you can always change it later. You can complete the setup wizard if you need some guidance, or skip it by clicking I don't need help. You have now successfully installed WordPress! Yay, you did it! Your new site is up and running, ready for you to take the world by storm. But don’t pop the champagne just yet, you can easily make it just a bit better, right? Using a premium WordPress theme is probably one of the best investments you can make when starting off with a new blog. The price tag may seem high at first (in the neighborhood of $60-$70), but you can easily get a site that looks like it was custom built for you at a fraction of the price a web designer or development shop will charge you (upwards of $5k and beyond!). Besides, you wouldn’t leave the house in sweatpants (well maybe you would - who am I to judge! ), so make sure your blog has all the looks to grab people’s attention and keep it. 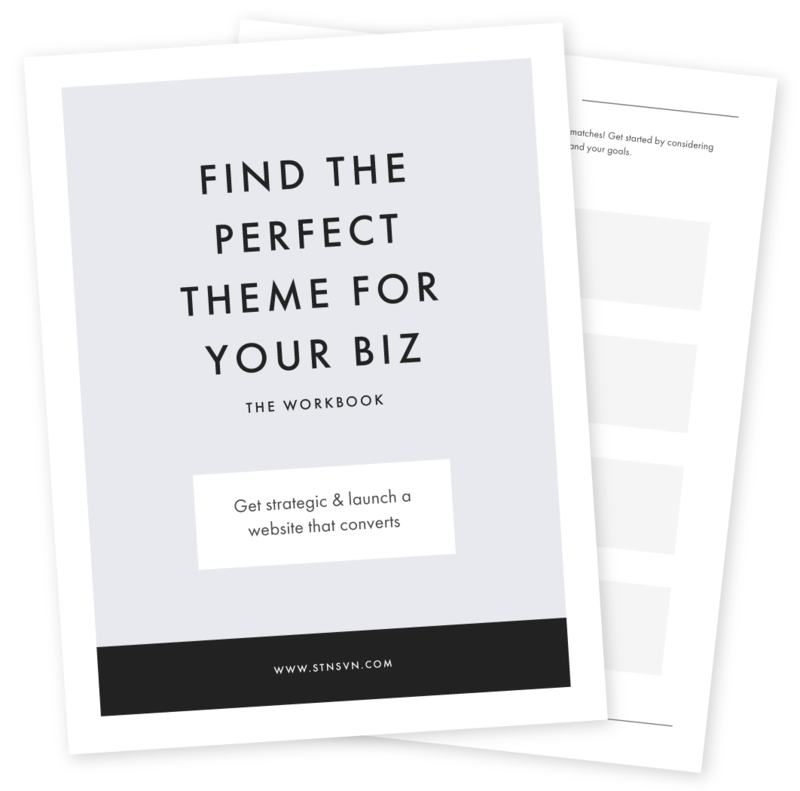 Before you start looking, grab our workbook below to get clear on what you need in a theme. Find a theme that works perfectly for your needs! When you're ready to pick a design that suits you, be sure to check out our premium minimalist WordPress themes that work great and look even better. We offer a handful of curate designs to match any blog or business website - check them out here. There are also many places online to get WordPress themes, but another one of our favorite places is Creative Market. Creative Market empowers designers from all over the world to produce and sell digital goods, and what you get here easily rivals some of the best custom sites out there (heck, they’re probably made by the same people). With over 1800 WordPress themes to choose from, you’re sure to find a design that suits your site. Ok, now you can pop that champagne! You’ve set up your hosting, installed WordPress, installed a premium theme and even written an awesome post or two - it’s time to share your new site with the world!